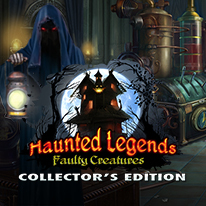 Enjoy the next installment of the Haunted Legends series! You’ve been called to investigate the murder of Alfred Oldgrey's fiancé. What starts as a simple investigation quickly takes a dark turn as you uncover family secrets and the invention of a mysterious mechanism. Can you find the culprit amidst the quarreling family before it's too late? Find out in this electrifying hidden-object puzzle adventure! - Uncover the Oldgrey family's secrets in the bonus chapter! - Earn achievements and find collectible skulls! - Replay your favorite HOPs and mini-games! - Download original music, videos, and unique artwork!